I think this is likely. There's no dates in the article (or ensuing cut and paste and rejiggle articles), just Nick Pope saying that he's discounted the Red Arrows. I don't believe him. In the photo it looks quite warm. It's 2009 and it is not yet summer, and the weather here has been pretty poor. Therefore the picture was taken earlier than 2009, or took place on a day that was warm. I don't think shopkeepers would risk putting goods outside if there was any chance of rain. I think it was taken in 2008. Someone else pointed out in the other thread that if you pan around you can actually see people looking up and taking pictures with their phones. I feel like an idiot for not seeing them the first time. The planes are not red because they look like they've used very wide-angle lenses (then corrected the images in software) which cause large amounts of distortion on the peripheries of the image (check out the tops of the lampposts - they should be straight). If the images were taken in June ... it could well be the fly past for the Queens birthday... its the 13th of June this year but the date varies over the first 3 weekends in June.. Very obvious (to me at least) that this is the diamond formation of the Red Arrows display team, as others have already pointed out here, and on the other thread. The objects in the picture appear round, and not red. Looks nothing like what you posted. Do the Red Arrows fly grey/silver orbs? You better explain..
Also it should be quite easy to find out if the Blue Angels where doing a semi-risky formation right over populated london houses. Something Im sure they love to do..right? Of all the formations flown by the Red Arrows, Diamond Nine is the most recognisable, and indeed has become the team's signature formation, which means that it features in the display every year. 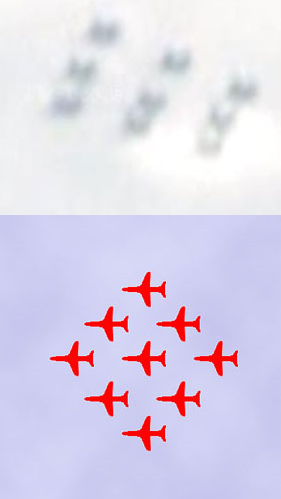 When watching the Red Arrows in Diamond Nine formation, look for symmetry between the left- and right-hand sides, and for the formation to be of good length. I have found some similair pictures only from real recognizable planes with even worse zoom. The picture resolution of Google streetview is not that crap that it will compress a plane into a ball. I tend to agree with Harmon. Even with crappy resolution, I can't make out a plane..where as those crappy res examples, it was clearly a plane. Just my $.02......Nick Pope cant figure it out either,and that's what he does for a living. You might have looked at the wrong spot. Here it is on Google. You can spot the odd formation pretty easily. If you click on the link to your pic and pan the camera around, you can notice that there are people on the other side of the street looking up with one guy even snapping a pic of it. So whatever it is, it's on someone's camera. I believe it was most likely the jets flying by though.